Prepare yourselves, Adventurers! Today, I present my ALL-TIME FAVORITE CHEESECAKE! Over Valentine's Day, I created a Chocolate Truffle Strawberry Swirl Cheesecake. Yup, that's right! Chocolate, strawberries, AND cheesecake! Talk about the ultimate Valentine's Day dessert for your loved ones! This cheesecake had chopped up chocolate truffles and a strawberry swirl heart pattern that was just perfect for the occasion! The pattern didn't hold up as well after baking, but it still tasted delicious! Just like chocolate-covered strawberries with cheesecake! Seriously... BEST. CHEESECAKE. EVER! I made the Strawberry Sauce a night before baking the cheesecake so I wouldn't have to worry about cooling the sauce. This cheesecake was also made with less sugar because my family doesn't like desserts that are overly sweet and I knew the chocolate truffles would add a lot for sweetness. Feel free to add more sugar if you want though! The tartness from the strawberry sauce balanced with the sweet chocolate and rich cheesecake was just perfection. Everyone in my family loved it! Blend cream cheese, sugar, vanilla, and eggs in a blender until smooth. Pour about 1/3 of the cheesecake batter into the crust and spread to evenly coat the bottom crust. Distribute chopped chocolate truffles evenly on batter. Cover the truffles with the remaining cheesecake batter. Place small dots of strawberry sauce (about 1 cm in diameter) in circles around your cheesecake. Use a toothpick or knife to run through each dot to make a heart pattern. Place cheesecake into a larger roasting pan and fill the roasting pan with water until it reaches about halfway up the cheesecake. Carefully place roasting pan with the cheesecake into the oven and bake for 35 minutes, or until the center is almost set. Cool and refrigerate for 3 hours. Serve with additional strawberry sauce. Blend the strawberries and sugar in a blender until smooth. In a small bowl, whisk together lemon juice and cornstarch. Add lemon juice mixture to the strawberry mixture and blend until combined. Strain the mixture into a medium saucepan to remove the seeds. Simmer over medium heat until the mixture starts to boil. Stir frequently and cook a few more minutes or until it thickens. Remove from heat and let cool to room temperature. Refrigerate if not using immediately. In America, guys usually give candy, flowers, and/or other gifts to the leading ladies in their lives on Valentine's Day. However, in Japan, girls give chocolates to guys instead. Honmei-choco are chocolates given to guys that girls have romantic feelings for. This would typically include crushes, boyfriends, and husbands. Giri-choco, on the other hand, are "obligation chocolates" given to guys that girls have no romantic interest in. Think of your guy friends, male co-workers, and male bosses. Honmei-choco are usually higher quality than giri-choco and often homemade. If you're interested in making your own easy chocolate gift this year, try making these Chocolate-covered Domo-kun Marshmallows! Sometimes, things just don't work out the way you want them to and these Pokeball Cake Pops are Exhibit #1. It was my first time ever making cake balls and they ended up lumpy and uneven and just sad. A total fail in my book. BUT I wanted to share them with you anyway. Japanese snacks fascinate me. Not only are they delicious, but they also come in rare, limited edition flavors. If you guys have been following my blog, you know I'm quite obsessed with Pocky. (You can read my posts about special Pocky flavors here and here.) I'm also totally obsessed with Koala no March cookies, which are crunchy koala-shaped cookies commonly filled with chocolate or strawberry filling. Occasionally, I'll find limited edition flavors at Japanese markets like Mitsuwa or Marukai and it takes every. ounce. of. my. willpower. not to buy them all! I did cave and try two of the specialty flavors though. The first flavor was "Creamy Caffellatte." When I first opened the package, I noticed a strong coffee smell. Creamy Caffellatte had a strong coffee flavor. They were sweet with a slightly bitter coffee taste and an artificial vanilla creaminess. The other flavor I tried was "Cocoa & Vanilla Ice." It said "Cocoa & Vanilla Ice" on the English nutrition label on the back, but you can see ice cream on the package. These cookies had a chocolate outer shell that didn't taste chocolatey. They smelled like vanilla and had a very sweet vanilla cream center. The cookies were sort of like ice cream with little crunchy "chocolate" bits - a clever execution of the ice cream concept, for sure, but I wish it had more chocolate flavor. These cookies were still super cute though! Just look at the barcode! Alas, I wish I could try more flavors! 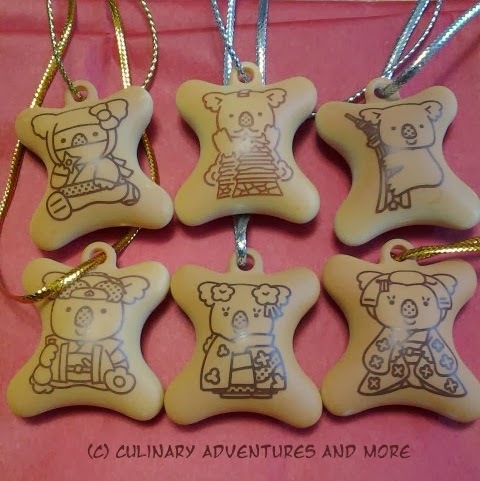 As a bonus, check out these Koala no March ornaments I ordered online! They're the exact size of actual cookies and are now my favorite Christmas ornaments! I like the ninja the best. What special flavors of Koala no March have you tried? Feel free to let me know what snacks you're addicted to in the comments below!